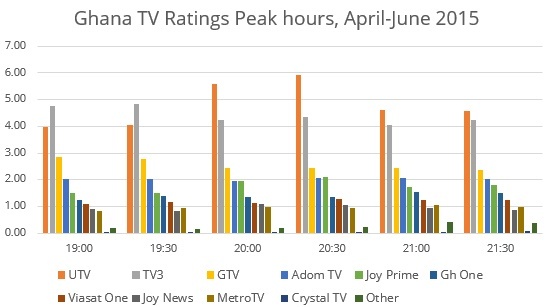 Using the daily data collected through GeoPoll’s Media Measurement Service, GeoPoll has analyzed the top TV stations in Ghana for Q2, April 1st – June 30th. 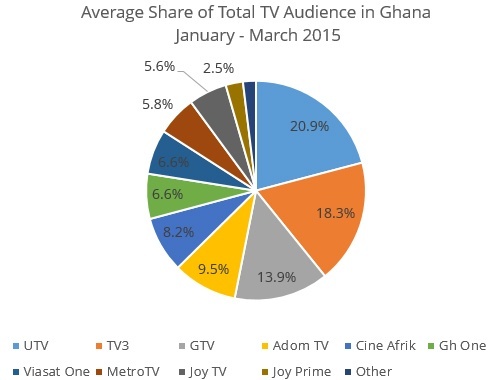 We examined both ratings* and share** for the top stations in Ghana. The below chart shows the average ratings for the top 10 stations during the peak hours, from 19:00 to 21:30. The below illustration shows that TV3 was leading in ratings from 19:00 to 19:30 when it airs its news show “News 360”. After “News 360”, UTV shows a strong jump with an average rating of 5.58 at 20:00 and 5.93 at 20:30 hence had the highest ratings in Q2 during the peak hours. During this time, UTV airs a popular soap opera ‘La Gata’. The other stations maintained sustained ratings during this time. GeoPoll also examined average share from April to June 2015. GeoPoll found that UTV had the highest share in Q2, capturing on average 22.4% of the audience. 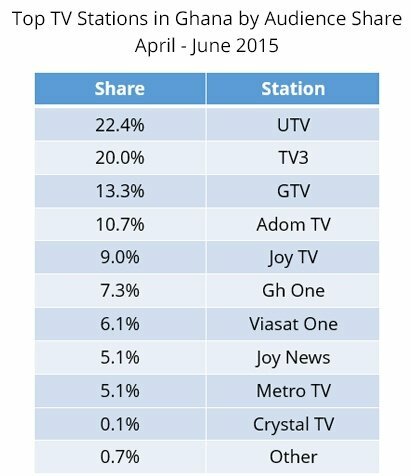 TV3 and GTV rank second and third with 20.0% and 13.3% respectively. For comparison, below is the share we observed for Q1, January to March 2015. During Q2, UTV and TV3 had a higher share than in Q1 where they had 20.9% and 18.3% share respectively.